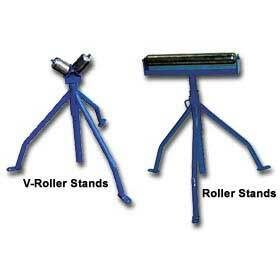 These ultra-light roller stands provide complete portability and versatility in any desired application. Height of stands adjustable up to 50". Two varieties offer mobility of flat and round materials. Each stand has weight capacity of 250 lbs. FOB Shipping Point. Width Wt. (lbs.) Price Ea.